In my quest for late fruit a friend from the forum brought this to my attention bellow find my review as listed in the forum. You can follow more about this fruit on a thread at the Tropical Fruit Forum. I top worked a tree on my grove in early January. Seems to have taken well. In a couple of years we will know how the tree does in this area. If it hold fruit until the end of January it may be of use. 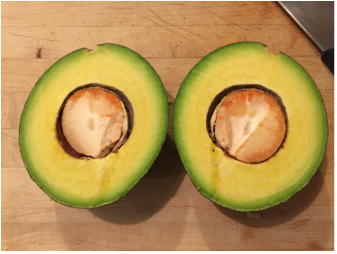 Kimber avocado: A Guatemalan beauty. Adam the fruit you gave me was 29oz, as it was turning dark during maturity, remind it me of a canon ball. The skin a a bit hard like many late fruit. As result I usually let this type of fruit mature a day more than what I really like. Flavor was a bit blander than let's say a Monroe but at the same time totally different in texture but very pleasant and creamy. No dark areas, no fiber at all, matures evenly. The seed was small compared to the size of the fruit, it show no sign of root emerging from the seed. I placed a piece in the refrigerator in plastic wrap and after 24 Hrs shows little sign of oxidation. A big plus for a big fruit. If this fruit stays on the tree until February it may be a nice fruit to have past the Monroe season. March 22, 2013: The grafts done in January 9, 2013 are all growing. Incredible, considering the dryness and woodiness of the bud wood. Looks like the Kimber is on its way to get establish in So. Florida. November 1, 2013: The tree is growing well. A couple of weeks ago I found it with a bad case of soft scale with developing sooty mold. Nothing I dislike more. There has not been any sooty mold in my grove for a couple of years. It was properly treated. Time will tell if this tree is susceptible to decease. February 14, 2014: The tree is doing well the scale is gone as well as the sooty mold. The tree seems to be pushing leaves in all fronts. I don't think we'll see flowers this year. February 19, 2015: Stopped by the the tree today. Looks real good. Is like 12-14 ft tall. I saw some open flowers and flowers buds ready to explode. See today's pictures. February 26, 2015: Inflorescence beginning to expand all over the tree. Should be in full bloom in 10 days or so. April 14, 2015: Almost done blooming. I see some small fruit in abundance. Hope to get to taste and see maturity. May 25, 2015: I keep going back to look at this tree. I can see more fruit now, it set a good amount and they are growing nicely. So far no fruit drop. June 13, 2015: I see a good amount of fruit in this tree. Seems clean as well. This fruit is looking similar to a Monroe in all its habits. Probably a Monroe seedling The big question is if it will hang in the tree longer. August 28, 2015: This tree is holding a lot of fruit. It is growing well and clean. I saw a couple in the ground but sometimes that happens to a loaded tree. Let's see how long the fruit stays in the tree. September 19, 2015: Really looking good, loaded, clean and holding it. The big question? when is it going to start dropping them. October 18, 2015: This tree is holding the fruit. Nothing significant on the ground looks like it is going to push into November, hoping for longer. This looks to be a winner, I picked a large fruit, 31 oz, to see if it ripens well. Thanks to Adam, Flying Fox Nursery. ​November 9, 2015: The tree is holding the fruit nicely. I picked a couple today to see how they ripen. The fruit looks clean. I will do a dry weight check in the next few days. December 12, 2015: The larger fruit has all dropped but the smaller fruit in the 1-1.5 lbs still hanging on.